Excerpted from The Feeling Good Handbook by David Burns. Copyright © 1999 by David Burns. Excerpted by permission of Penguin Putnam, Inc. All rights reserved. No part of this excerpt may be reproduced or reprinted without permission in writing from the publisher. HTML and web pages copyright © by SpiritSite.com. Many people believe that their bad moods result from factors beyond their control. They ask, "How can I possibly feel happy? My girlfriend rejected me. Women always put me down." Or they say, "How can I feel good about myself? I'm not particularly successful. I don't have a glamorous career. I'm just an inferior person, and that's reality." Some people attribute their blue moods to their hormones or body chemistry. Others believe that their sour outlook results from some childhood event that has long been forgotten and buried deep in their unconscious. Some people argue that it's realistic to feel bad because they're ill or have recently experienced a personal disappointment. Others attribute their bad moods to the state of the world — the shaky economy, the bad weather, taxes, traffic jams, the threat of nuclear war. Misery, they argue, is inevitable. Of course there's some truth in all of these ideas. Our feelings undoubtedly are influenced by external events, by our body chemistry, and by conflicts and traumas from the past. However, these theories are based on the notion that our feelings are beyond our control. If you say, "I just can't help the way I feel," you will only make yourself a victim of your misery — and you'll be fooling yourself, because you can change the way you feel. If you want to feel better, you must realize that your thoughts and attitudes — not external events — create your feelings. You can learn to change the way you think, feel, and behave in the here-and-now. That simple but revolutionary principle can help you change your life. To illustrate the important relationship between your thoughts and your moods, consider the many ways you might react to a compliment. Suppose I told you, "I really like you. I think you're a neat person." How would you feel? Some people would feel pleased and happy. Others might feel sad and guilty. Some people would feel embarrassed, and some would react with anger and annoyance. What explains such different reactions? It's because of the different ways they might think about the compliment. If you feel sad, you're probably thinking, "Ah, Dr. Burns is just saying that to make me feel good. He's just trying to be nice to me, but he doesn't really mean it." If you feel annoyed, you might be thinking, "He's flattering me. He must be trying to get something from me. Why isn't he more honest?" If you feel good about the compliment, you're likely to be thinking, "Gee, Dr. Burns likes me. That's great!" In each case the external event — the compliment — is the same. The way you feel results entirely from the way you think about it. That's what I mean when I say that your thoughts create your moods. This is also true when something bad happens. Suppose someone you respect criticizes you. How would you feel? You may feel guilty and inadequate if you tell yourself you're no good and the problem is all your fault. You will feel anxious and worried if you tell yourself that the other person is looking down on you and is going to reject you. You'll feel angry if you tell yourself that it's all their fault and they have no right to say such unfair things. If you have a good sense of self-esteem, you might feel curious and try to understand what the other person is thinking and feeling. In each case, your reaction will depend on the way you think about the criticism. The messages you give yourself have an enormous impact on your emotions. And what's even more important, by learning to change your thoughts, you can change the way you feel. 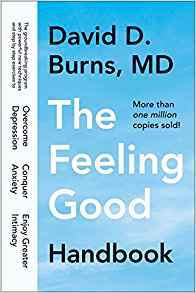 The powerful methods described in this book have helped thousands of people take greater charge of their emotions, their careers, and their personal relationships — and they can help you. It's not always easy. Considerable effort and persistence are sometimes required to snap out of a bad mood. But it can be done! The techniques are practical and straightforward, and you can make them work for you. This new approach is called "cognitive behavior therapy" because you can learn to change the way you think, the way you behave, and the way you feel. A "cognition" is simply a thought. You may have noticed that when you feel depressed or anxious you are thinking about yourself and your life in a pessimistic, self-critical way. You may wake up feeling discouraged and tell yourself, "Ugh! What's the point in getting out of bed?" You may feel anxious and inferior at a social gathering because you tell yourself, "I don't have anything witty or interesting to say." Cognitive therapists believe that these negative thinking patterns actually cause you to feel depressed and anxious. When you think about your problems in a more positive and realistic way, you will experience greater self-esteem, intimacy, and productivity. If you want to break out of a bad mood, you must first understand that every type of negative feeling results from a specific kind of negative thought. Sadness and depression result from thoughts of loss. You think you have lost something important to your self-esteem. Perhaps you were rejected by someone you cared a great deal about. You might have retired or lost your job or missed out on an important career opportunity. Frustration results from unfulfilled expectations. You tell yourself that things should be different from the way they really are. For example, "That train shouldn't be so late when I'm in a hurry! Darn it!" Anxiety and panic result from thoughts of danger. Before you give a speech in front of a group of people, you feel nervous because you anticipate that your voice will tremble and your mind will go blank. You imagine that you'll make a fool of yourself. Guilt results from the thought that you are bad. When a friend makes an unreasonable request, you may feel a twinge of guilt and think, "A really nice person would say yes." Then you may agree to something that isn't really in your best interest. Feelings of inferiority result from the thought that you're inadequate in comparison with others. You think, "She's so much better looking than I am" or "He's so much smarter and more successful. What's wrong with me?" Anger results from feelings of unfairness. You tell yourself that someone is treating you unjustly or trying to take advantage of you. The list on pages 6-7 illustrates the connection between your thoughts and your feelings. Study this table carefully. It will help you understand why you're in the mood you're in, and this can make it easier to change the way you feel. Thoughts of loss: a romantic rejection, the death of a loved one, the loss of a job, or the failure to achieve some important goal. You believe that you've hurt someone or that you've failed to live up to your own moral standards. Guilt results from self-condemnation, whereas shame involves the fear that you'll lose face when others find out about what you did. You feel that someone is treating you unfairly or trying to take advantage of you. Life falls short of your expectations. You insist that things should be different. It might be your own performance ("I shouldn't have made that mistake"), what someone else does ("He should've been on time! "), or an event ("Why does the traffic always slow down when I'm in a hurry?"). You believe you're in danger because you think something bad is about to happen — "What if the plane crashes?" "What if my mind goes blank when I give my talk in front of all those people?" "What if this chest pain is the start of a heart attack?" You compare yourself to others and conclude that you're not as good as they are because you're not as talented, attractive, charming, successful, intelligent. "She's really got what it takes. She's so cute. All the men are chasing her. I'm just average. There's nothing very special about me." You tell yourself that you're bound to feel unhappy because you're alone and you aren't getting enough love and attention from others. You feel convinced that your problems will go on forever and that things will never improve. "I'll never get over this depression," or "I just can't lose weight and keep it off," or "I'll never find a good job," or "I'll be alone forever." What you will learn here is that even though you are convinced they are valid, most of the negative thoughts that make you feel bad are distorted and unrealistic. Example: Following a romantic breakup or divorce you tell yourself, "It's all my fault. I must be unlovable. I'll never be close to anyone." You feel so rotten that it seems absolutely true, and you think your life is over. Months later you begin to date and you start to feel close to people again. It suddenly dawns on you that you are lovable after all, that you weren't entirely responsible for the breakup of your relationship. You wonder how in the world you could have believed all the put-downs you were heaping on yourself. But at the time, your negative thoughts seemed completely valid. That's one of the peculiar things about bad moods — we often fool ourselves and create misery by telling ourselves things that simply are not true. And the strange thing is that we usually don't have the vaguest suspicion that we're being conned by our misery and self-doubt. The ten forms of distorted thinking that lead to negative moods are listed on pages 8-11. Study this list carefully, because you will refer to it frequently as you do the exercises in this book. Many people have told me that this list changed their lives. One disclaimer is necessary. There are many times when negative feelings are healthy and appropriate. Learning when to accept these feelings and how to cope with a realistically negative situation is just as important as learning how to rid yourself of distorted thoughts and feelings. If a loved one is seriously ill, you will feel concerned. These sad feelings are a sign of caring. If the house you had your heart set on is sold to someone who made a slightly higher offer, it is natural to feel disappointed. If you're having an argument with your spouse, you will probably feel angry and hurt. If you have to give a speech or start a new job or ask your boss for a raise, you will probably feel a little nervous. It's often best to accept these negative feelings. I don't believe that you should try to be happy all the time, or in total control of your feelings. That would just be a perfectionistic trap. You cannot always be completely rational and objective. Certainly I'm not! I have my share of shortcomings, my dark moments of self-doubt, my periods of irritability. I believe these experiences give us the opportunity for growth, for intimacy, and for a deeper comprehension of what it means to be human. You assume that your negative emotions necessarily reflect the way things really are: "I feel terrified about going on airplanes. It must be dangerous to fly." Or "I feel guilty. I must be a rotten person." Or "I feel angry. This proves I'm being treated unfairly." Or "I feel so inferior. This means I'm a second-rate person." Or "I feel hopeless. I must really be hopeless." Many people try to motivate themselves with shoulds and shouldn'ts, as if they were delinquents who had to be punished before they could be expected to do anything. "I shouldn't eat that doughnut." This usually doesn't work because all these shoulds and musts make you feel rebellious and you get the urge to do just the opposite. Dr. Alber Ellis has called this "musterbation." I call it the "shouldy" approach to life. Some people do the opposite. They blame other people or their circumstances for their problems, and they overlook ways that they might be contributing to the problem: "The reason my marriage is so lousy is because my spouse is totally unreasonable." Blame usually doesn't work very well because other people will resent being scapegoated and they will just toss the blame right back into your lap. It's like the game of hot potato — no one wants to get stuck with it. "If you want to feel better, you must realize that your thoughts and attitudes — not external events — create your feelings."